Troston is a little-known village in the quiet lanes between Bury and Diss. 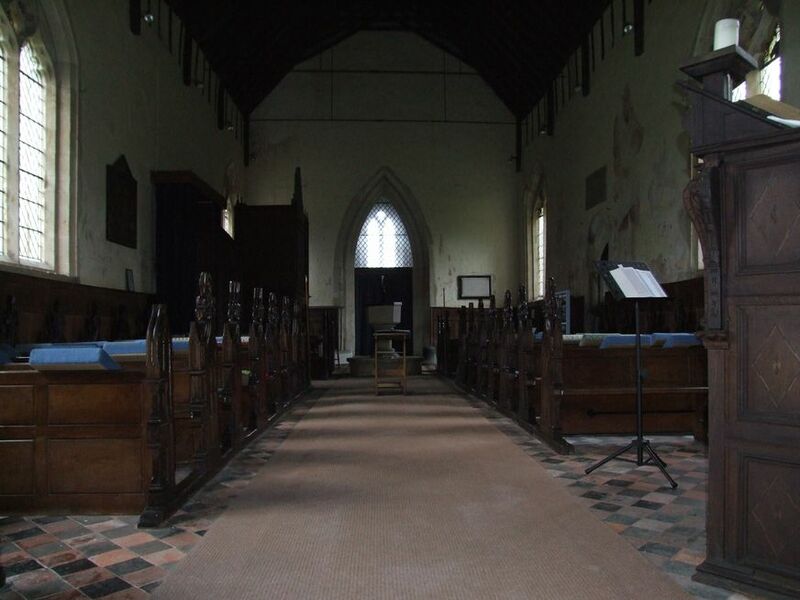 I have always had a place in my heart for it, because it was one of the very first churches I ever visited when I began cycling around Suffolk back in 1999. I came back here several more times with with my children when they were little, and one of my fondest memories is of my little boy chatting to an enormous Rhode Island Red that lived in the cottage across the road. It was as big as he was. Coming back in 2008, not much had changed. The village was as purposeful and pleasing as ever, the church quietly grand in the cleared graveyard. There were still chickens at the cottage across the road. St Mary was one of the first half dozen churches on this website, and because of this its entry became less useful and more embarrassing as the years went by. But coming back, I remembered it exactly as it had been, and as I walked up to the porch I sensed the ghosts of two little children zigzagging around me about the wide path. 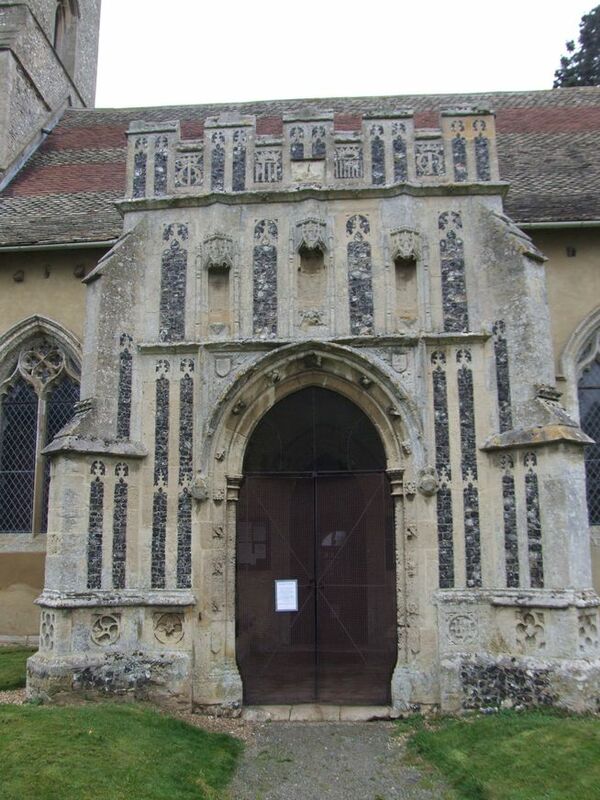 The porch is a bold, confident statement of the late 15th century, with image niches, Marian monograms and a dedicatory inscription in the flushwork. When I'd come this way before, I'd needed to go and get a key, but now the church is open to strangers and pilgrims every day. St Mary is a complex building. We have a clear view of all the architectural details, although the church's setting does rather lack the atmosphere and drama of wilder churchyards. 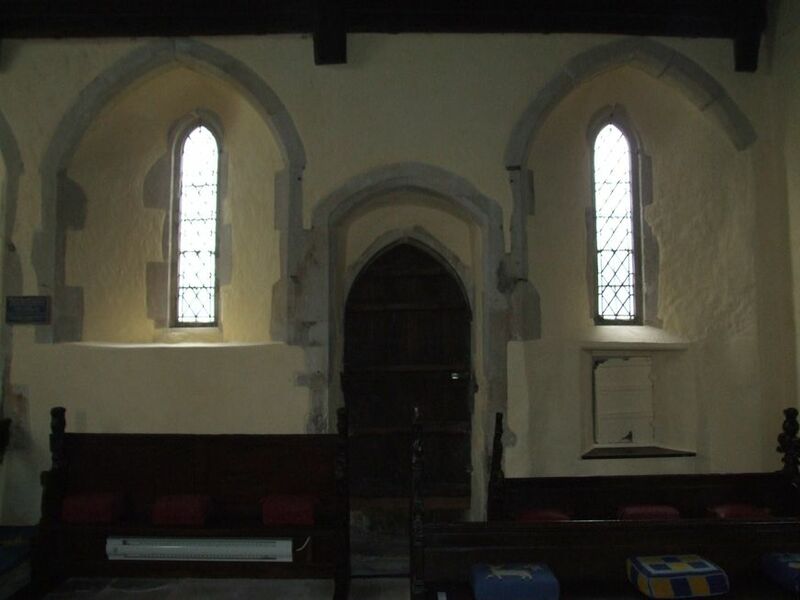 This is an old building, and the porch and Decorated windows should not distract from the fact that St Mary looked pretty much as it does now by 1300, when the tower was added to the existing nave and earlier chancel. The font remains from those days - there is great continuity here. 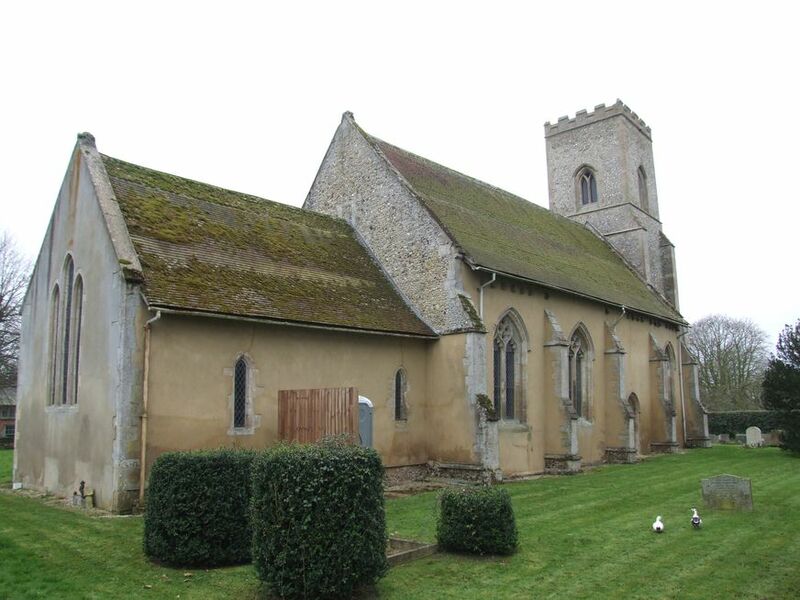 St Mary can seem gloomy as you step into it - we haven't been prepared for gloom by an obviously Norman structure as we will be at Thornham Parva or Wissington. But as your eyes become accustomed to the light, you realise you are inside a church of outstanding interest. Or so it has always seemed to me. 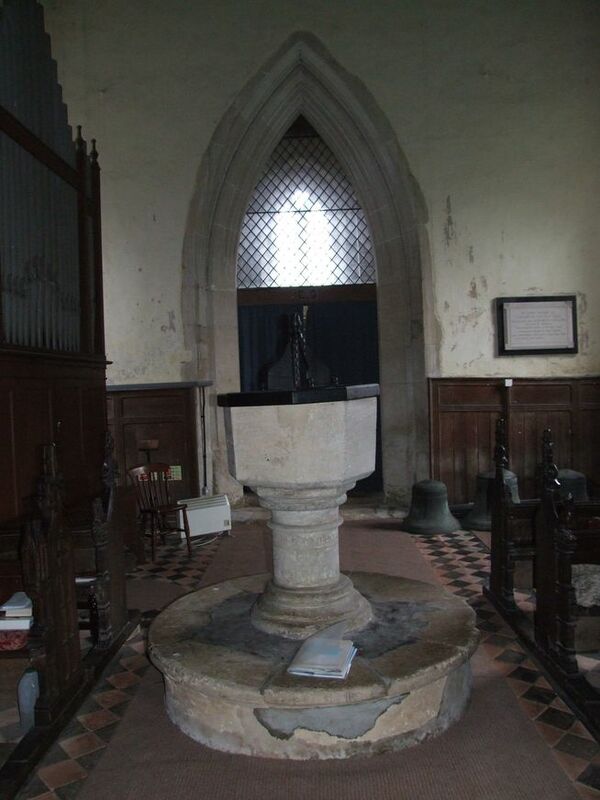 In the years since, I have become more interested in the fixtures and fittings which later centuries would bring, but my breath was first taken away here because there is so much remaining which still speaks of the medieval Catholic liturgical life of Troston. Firstly, and most famously, the wall paintings. They are in a fine state of repair. Most prominient are the 15th century figures of St Christopher and St George. St Christopher, of course, is familiar from a hundred other East Anglian churches. Virtually every medieval church had his figure opposite the south entrance. But this is a regal Christopher, a grace to his movement. St George is another fine figure, and a powerful portrait. You can sense the force with which the lance is pushed home. There is another figure, a knight on hoseback, who appears to be forcing his lance into a dragon-shaped space. It may well be another St George. But the most interesting thing about it is that it is older than the two larger paintings. It is a reminder that wall paintings in churches were successively covered and repainted as artistic fashions and devotional priorities changed and developed. In many places, we find that by the later years of the 15th century they are being covered up, and the walls are being punched through with large windows, to illuminate the new arrangement of pulpit and benches, and the great rood above the chancel arch - this, a full half century before the Protestant Reformation. The most moving of the paintings here is an excerpt from what appears to be a 14th century martyrdom of St Edmund. Troston is about halfway between the probable site of that martyrdom in Hoxne and the final resting place at Bury Abbey. These paintings are all on the north wall, but above them all, over the chancel arch, sits a 15th century Christ in Judgement. In the chancel, St Mary retains the fixings for the Lenten veil, and the Early English detailing of the south wall still suggests something of the quiet mystery of medieval Catholicism before the awe and wonder of the 15th century Perpendicular mood made its impression on Suffolk churches. 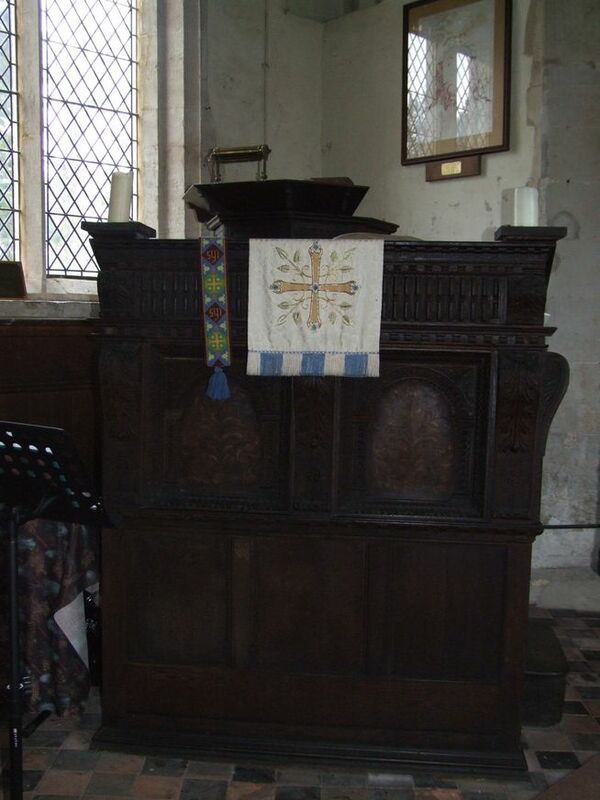 The woodwork behind the altar was probably the eastern parapet of the rood loft, a rare survival. 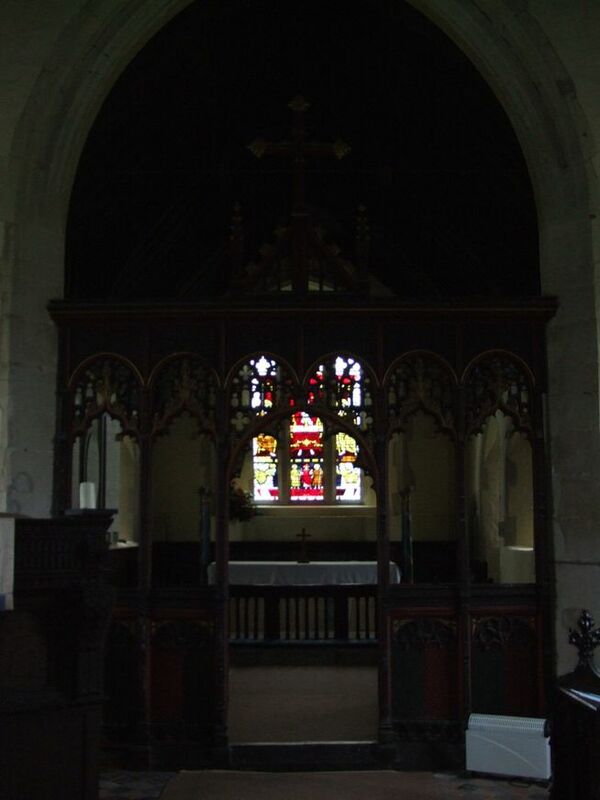 But the finest feature of the chancel is not medieval at all. 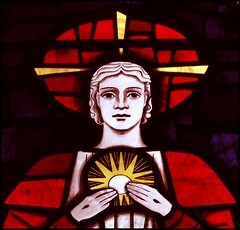 It is the 1964 east window, by Harry Stammers, and it must rank among the finest of his work. It depicts the story of Emmaus, the unrecognised Christ walking along the road with his two companions, and then making himself known to them above at the supper table in the breaking of the bread. It is beautiful. As with many churches, St Mary retains its low-side window. 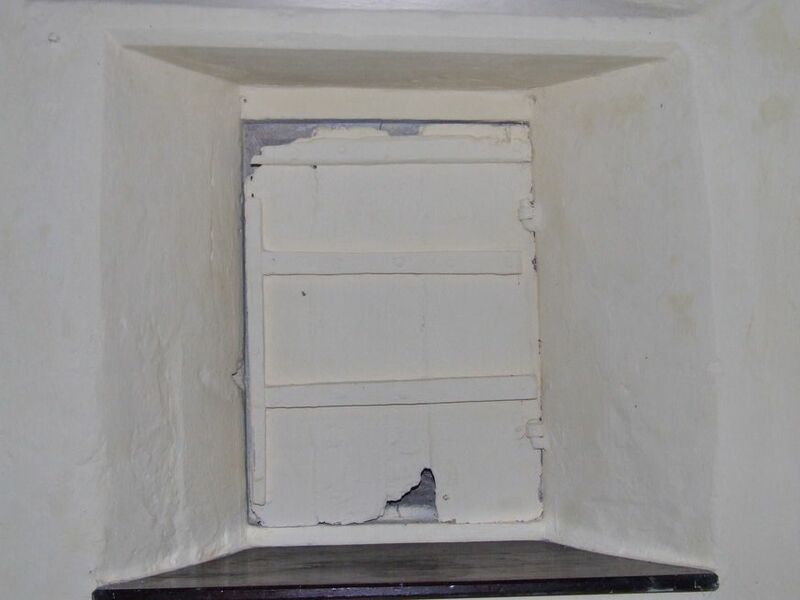 Theories abound about low-side windows, but they were certainly intended to be opened for the sanctus bell to be rung at the consecration of the Mass, and were also probably a means of controlling ventilation. The flicker that the updraft of air would have given to the candles on the rood loft might not have been intended, but it would certainly have been effective. Uniquely in Suffolk, Troston retains the wooden shutter which the clerk would open to ring the bell, integrating those outside the building working in the fields with the whole community. At the back of the nave is a curiously-worded early 20th century memorial to a Rector's wife who had, in the phrase more familiar from the Baptist tradition, passed over. On the benches nearby are the remains of carvings, including a figure kneeling at a prayer desk which might have been part of an Annunciation. On the south side of the nave are the war memorials, with poignant photographs beneath. Beyond, and something you certainly won't miss, the huge pulpit and reading desk are as big as a family car parked at the east end of the nave. And then there is the royal arms, which have been relettered for George I, but are actually Stuart arms for James I, including that monarch's motto asking God to rise up and disperse his enemies. My only sadness in coming back here was that the old visitors book had gone. I had hoped to leaf back and find memories of past visits, but I had not been here in the time of the new book. Ah well. 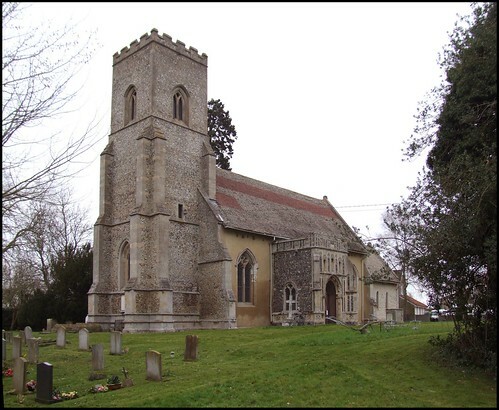 Troston church is an interesting and unusual church which is not as well-known as many of Suffolk's other churches. 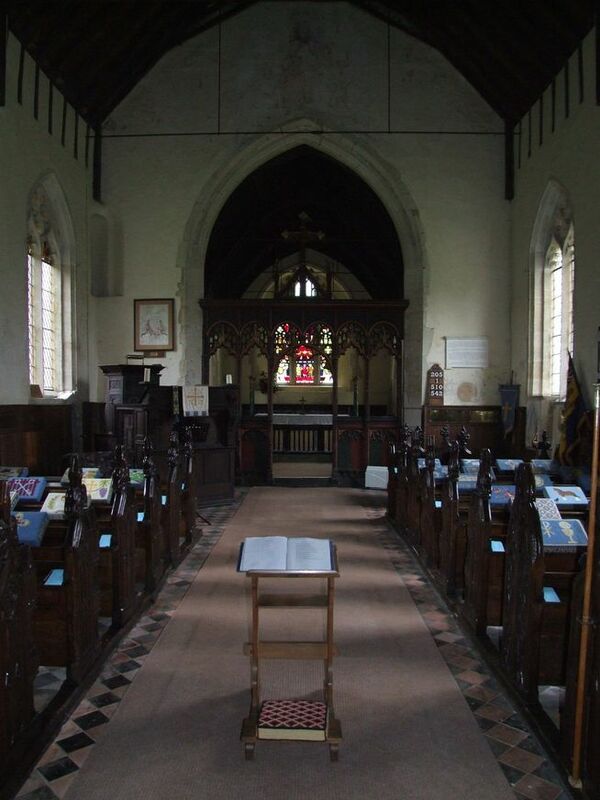 This is a church to savour, hopefully in silence and solitude. Things here need to be contemplated. It is a place to sit and look and be drawn into thought and prayer.